One of the most innovative post hole diggers available, an auger is a device that is commonly used for drilling. Resembling a corkscrew, most augers feature a rotating blade or ‘flitting’ that acts in the same manner as a corkscrew would. The blade rotation on an auger is used to bore holes into the earth, and occasionally materials or matter such as rocks, wood or even concrete. Augers are a popular and favourable tool to drill holes in wood, and are frequently used to create deep holes, and guarantee strong bases for new fence builds as their cutting is acute, deep and accurate. For anyone looking for an auger for sale, Bullmax is the perfect company to provide the most suitable auger from any job. The Bullmax Earth Auger, Model BMEA-52-2 comes equipped with a 2-stroke 52CC Engine which simply exudes power. It has a heavy-duty gearbox and retains commercial quality that is appreciated by Australians nationwide. With a 30:1 gear ration and a premium quality safety system, this auger is in demand by users across Australia. The Bullmax BMEA-68 auger is also an excellent auger. Slightly larger than its sister product, the auger features an air cooled 2-stroke engine. The 450mm extension bar ensures ease of use and the 8,000 revs per minute engine system is ideal for anyone wanting to drill fast and continuously. Bullmax ensures that all of their products come with a 12-month warranty as they only supply the highest quality premium products to Australians. 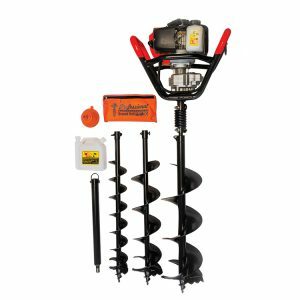 THE BULLMAX ONE MAN POSTHOLE EARTH AUGER COMES WITH THE COMPLETE PACKAGE ALL INCLUDED. COMMERCIAL QUALITY ENGINE AND GEARBOX, 100MM, 150MM, 200MM DRILLS, 500MM EXTENSION BAR, RECOIL IMPACT SPRING, SHEAR BOLT OVERLOAD SAFETY SYSTEM AND 12 MONTH WARRANTY. THE BULLMAX ONE MAN POSTHOLE EARTH AUGER COMES WITH THE COMPLETE PACKAGE ALL INCLUDED. COMMERCIAL QUALITY ENGINE AND GEARBOX, 100MM, 150MM, 200MM DRILLS, 450MM EXTENSION BAR, RECOIL IMPACT SPRING, SHEAR BOLT OVERLOAD SAFETY SYSTEM, EPA 52CC INDUSTRIAL ENGINE AND 12 MONTH WARRANTY. 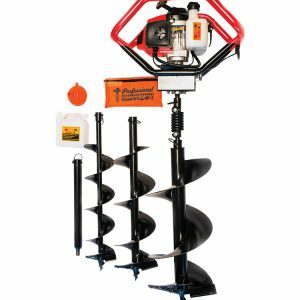 THE BULLMAX TWO MAN POSTHOLE EARTH AUGER COMES WITH THE COMPLETE PACKAGE ALL INCLUDED. COMMERCIAL QUALITY ENGINE AND HEAVY DUTY GEARBOX, 100MM, 250MM, 300MM DRILLS WITH REPLACEABLE CUTTING BLADES, 450MM EXTENSION BAR AND RECOIL IMPACT SPRING.